Back Home Check Out our new Website that offers an excellent Search Function and On-Line Ordering!! LPI Racing knows the difference between "Street" cars and "Race" cars. We sell products for both. With over 15 years experience in Motorsports activities we have seen several products that work well, and more that don't. But more importantly, we want to build your trust so you always know who to come to for your performance needs. Let us hook you up with winning products for your car today! LPI Racing uses what we sell. Our shop car, a'95 Cobra R Mustang utilizes many products we sell. This experience gives us first had knowledge for many of the products you are looking for. The owners of LPI Racing at the 2006 San Jose Grand Prix, enjoying a photo opportunity with the local attractions. Livermore Performance sells Derale products on our new site LPIRacing.com. Derale produces Electric Fans, Oil Coolers, Oil Filter Adapters, Oil Filter Relocation Kits, Thermostats, power Steering Coolers, Transmission Coolers and Transmission Pans. Keep you and your car cool with Thermo Tec products. 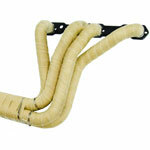 LPI Racing offers Header Wrap, Heat Barriers, Starter Heat Shields and Battery Wrap. For general listings to include all cars, use the links listed under Products. If you only care about one car, use the links listed under Car Specific Products or click on the following: Acura / Honda, BMW, Mini, Corvette, Ford / Lincoln / Mercury, Ford Mustang, General Motors, Infiniti / Nissan, Mazda and Porsche.